The Nokia N9 has just been unveiled to the world and it’s already achieved something that very rarely happens – it’s left me lost for words! 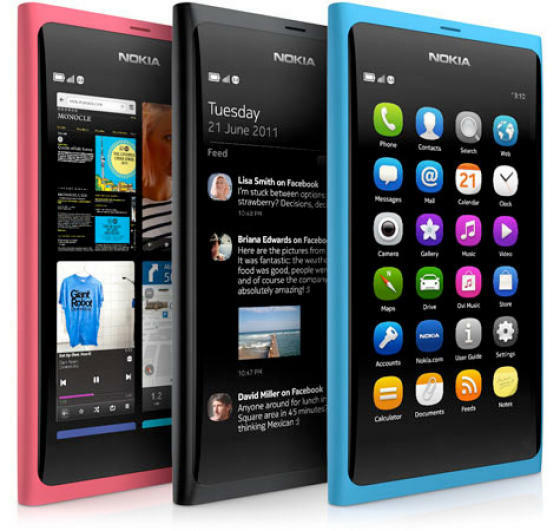 For the N9 is the phone that really is – finally – Nokia’s iPhone killer. The N9 is the first Nokia phone in a long time that has the interface right, the user experience right, and the quality of the underlying hardware (mostly) right. It’s a compelling package with some stunning features, forged under tremendous pressure as Nokia reeled from internal convulsions as chief engineers, CEOs and even corporate strategies seemingly forged in stone, all left the company within the space of a year. Against this backdrop, Nokia has created something special with the N9. Everything about it – from the Operating System to the user interface, the design, the functionality, the apps, the features – absolutely everything has been written from scratch. That’s an insane amount of work and Nokia’s engineers should be rightly proud of what they’ve achieved. But what’s even more insane is that this really is the last true Nokia smartphone you’ll ever see. All the hard work and effort that’s gone into the N9 will be thrown away as the company’s new strategy focuses solely on Windows Phone 7. It beggars belief! For the moment, though, let’s give the engineers the credit they deserve, and see what the N9 has to offer. The Nokia N9 is Nokia’s flagship smartphone for 2011. Actually, it’s Nokia’s only new smartphone of 2011 and is the one phone the company can rely on to earn it some money in what has been a desperate year! Where other Nokia smartphones have used the companies Symbian OS, the N9 uses the brand new MeeGo Ooperating System instead. This is a very good thing, as Symbian had turned into a lumbering dinosaur. 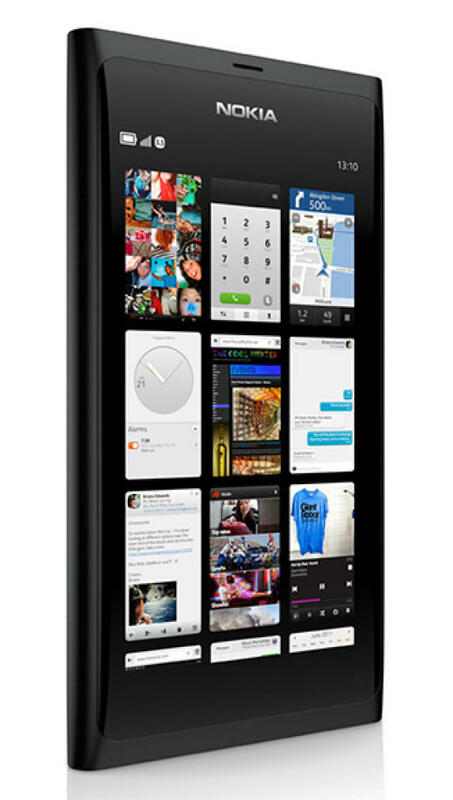 MeeGo, in contrasts, has evolved at break-neck speed as something truly capable of taking on Android and iOS. The N9 uses MeeGo 1.2 with what Nokia is calling the Harmattan skin (Nokia’s own user interface) on top. This skin is very similar in concept to HTC’s Sense UI, which is a skin that runs on top of Android and helps differentiate HTC’s Android phones from any other manufacturers. If Nokia added their own skin to MeeGo, you have to wonder why they didn’t just adopt Android earler and put the Harmattan skin over that rather than developing their own Operating System from the ground up, but if Nokia’s strategy made any sense, they wouldn’t be in the predicament they are now! The N9, is a brand new phone in every sense of the word. New hardware, new software, new interface, new OS, new features – even new gestures. Let’s see what makes it so special. In some ways the N9 is reminiscent of Android. When you wake the phone up from its slumber, you see a series of icons, while a swipe will move the user to the next homescreen. Although not exactly novel, the movement is extremely fluid and reassuringly intuitive. app switcher screen – a series of apps that are currently running, letting you select the one you want via a single touch. None of this is remotely new, but to see it running on a Nokia using Nokia’s own design is extremely refreshing. It’s a similar story with the N9’s onboard apps. Its music player, gallery and camera interface are all familiar, yet at the same time different, giving you a real feeling that what you’re holding is something very unique. That certainly puts it on a par with the Sony Ericsson Xperia Arc. True, it’s not as powerful as the Samsung Galaxy S or HTC Sensation, but it’s certainly up there with the big hitters of the smartphone world. But don’t forget the quality of Nokia’s features. Sure, the N9’s processor might be no match for the Galaxy S II, but you can bet that the camera will be best in class. Even more interesting is what Nokia has achieved with NFC, the contactless technology that’s currently all the rage. Rather than focus on contactless payments, Nokia uses NFC in the N9 to pair the device with other devices using Bluetooth. Just look at the video below. Play music on your N9 and transfer it to a speaker or headphones, just by tapping the N9 onto the speaker or headphones. No settings, no buttons to press – just tap and the music is transferred instantly. That’s a fantastic new innovation, and something that Samsung really should have thought of first. I said at the start of this post that the N9 has left me speechless. Why? Well consider this. The N9 was cancelled several months ago. Prior to that, it was hailed as the saviour of Nokia. Through it all, it survived not just its premature cancellation, it also survived Nokia’s CEO leaving, Nokia’s MeeGo chief Ari Jaaski leaving, countless managers leaving, and a new CEO joining who killed the MeeGo project in favour of Windows Phone 7. At the same time, tens of thousands of Nokia employees were fired, Nokia’s Symbian coders were forced to transfer to Accenture, and the company’s share price halved from $12 to $6 a share in the space of six months (it was nearly $40 a share when the iPhone was launched in 2007!) as investors realized just how dire a position Nokia was in. And yet, despite all this, the N9 looks to be a winner. If the finished product can be as good as this early pre-production unit looks, and if the company can deliver it on time (Q4 2011), Nokia has done the impossible – it’s actually produced a worthy competitor to the iPhone and Android just when all hope seemed lost! The bitter irony is that, for the N9, and MeeGo in particular, all hope really is lost. Thanks to new CEO Elop, there won’t be another MeeGo smartphone. It’s a genuine shame that through some spectacularly bad managerial decisions, MeeGo and the N9 will both be still-born, and the N9 engineers will never get their chance to go beyond what the N9 has achieved. As one of the Harmattan Application team has said on his personal blog, these engineers should feel rightfully proud of what they’ve achieved. I’ll be giving the N9 a throrough review when it’s released later in the year, and I can’t wait to see how it compares to the latest Android devices – and most mouth-wateringly of all, the new Nokia Windows Phone 7 devices!